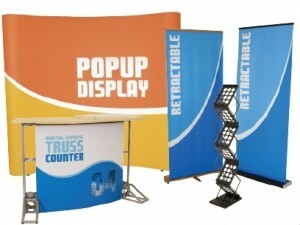 A Pop-Up Display is a portable option for making a professional impression at New Orleans trade shows and conventions. Cultivate excitement and bring attention to your brand. Bring out the best in your business. Conventions and Trade Shows are opportunities for you to highlight key aspects of your company. Pop-Up Displays can really bring things together—messaging, vision, mission, products and services work together in a cohesive presentation that is appealing and speaks well to your brand. Overall positive results come from a connection between your company's intent and what you can offer potential clients. We offer cutting-edge graphic design services and have a team that will work closely with you to create customized pop-up displays that catch and present your message in an organized and well planned way. Be sure your professional identity, your brand identity and your business values are well represented. When potential clients see well designed Customized Pop-Up Displays, they immediately associate that with a quality product or service. These displays are perfect for travel, are easy to cart around and can be set up in minutes. The graphic retracts into the base of the banner stand hardware and comes with different color backgrounds so that you have a display for different presentations. Available in any size and color, our Customized Pop-Up Displays allow you implement creative designs and a personalized layout that fits your brand. Take your company to the next step ahead of your competition.